Create memories that will last forever! 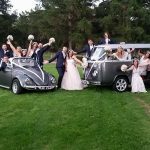 Imagine yourself and your bridal party arriving in ultimate style to your wedding or event in our beautiful fully restored VW Kombi. Jazzy is our modern and uniquely styled microbus that seats 8 and will be sure to impress you and your guests. Our latest edition is our 1969 convertible Beetle that seats 3, to pair nicely with the Kombi. 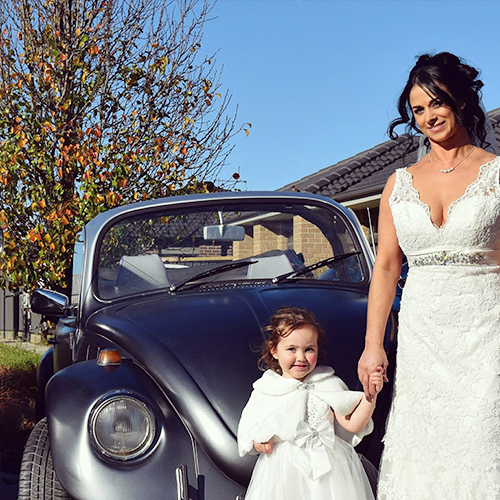 We loved our special day with your fanastic Kombi. Lana & Pete made sure our day was extra beautiful with the presentation and service for our wedding. The van was very spacious and comfortable for the whole bridal party. Plenty of room for my dress without feeling restrained. Thank You so much Kombis I Do. 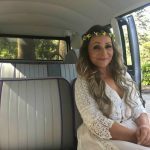 My Wife and I hired both the Kombi and Beetle for our Wedding. We cannot thank Lana & Pete enough. The communication leading up to the big day was second to none. We we’re absolutely blown away by the cars. They looked incredible in all the photos and videos. 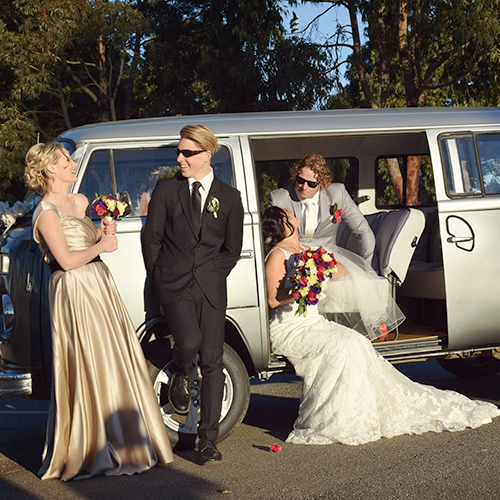 We can’t wait to get our professional bridal party photos back with everyone hanging out the windows of the Kombi. If you’re thinking of hiring Kombi’s I Do for your special day DO NOT hesitate. We can’t recommend them enough. Thanks so much for helping make our day everything we ever dreamed of! I had the pleasure of hiring this absolutely stunning Kombi for my wedding last Saturday. Lana and Pete are fantastic to deal with and offer a 1st class service. 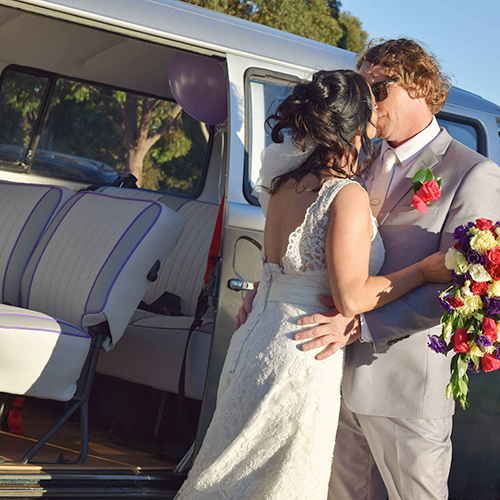 I couldn’t have been happier driving to our big day up the windy roads of Mt Dandenong in this very special Kombi. Thank you Lana and Pete for the impeccable service you provided for us. 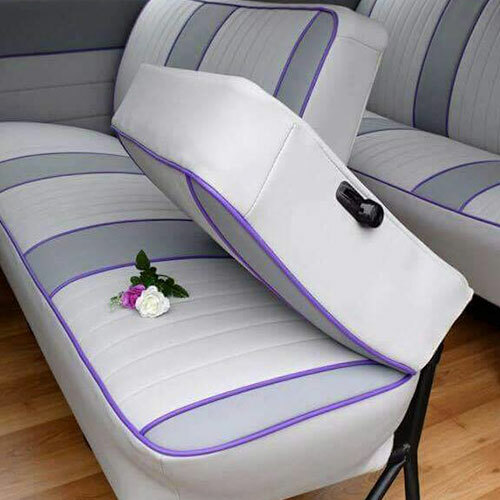 What can I say, Kombis I Do are incredible! From the start they were nothing but professional and attentive. On the weekend, I married my best friend. He was arriving in a metallic grey helicopter, so it was only fitting that I arrived in a matching colour Kombi! The pair complimented each other, much like my HUSBAND & I! © 2019 Kombis I Do. All Rights Reserved.